On March 2, the Supreme Court will hear oral arguments in two cases that concern the placement of Ten Commandments displays on public property. The commandments controversy came to national prominence in 2003, when the chief justice of the Alabama Supreme Court, Roy S. Moore, refused to honor a court order to remove a 5,280-pound Decalogue monument from his courthouse and was subsequently removed from office. The Supreme Court has declined to involve itself in Moore’s case, but it is considering the constitutionality of displaying copies of the commandments on courthouse walls in two Kentucky counties and on the grounds of the Texas State Capitol. Are the commandments an integral part of American legal and cultural history, and thus deserving of display in government buildings? Or, as others claim, could this constitute a constitutionally inappropriate government promotion of religion? What impact will these cases have on future church-state issues, especially those involving the display of religious symbols, such as nativity scenes, on government property? LUIS LUGO: Good afternoon, and my heartfelt thanks to all of you for showing up today despite the inclement weather. This is a town where we refuse to be cowed by terrorists but a couple of inches of snow will bring us to our knees. (Laughter.) 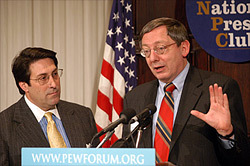 My name is Luis Lugo and I am the director of the Pew Forum on Religion & Public Life. We are a nonpartisan organization and we do not take positions on policy debates, including the issue under consideration this afternoon. The Forum is a project of the Pew Research Center here in Washington. It is my pleasure to welcome you to what we believe will be an informative discussion on the constitutionality of state-sponsored displays of the Ten Commandments. As I’m sure most of you know, next Wednesday the Supreme Court will be hearing oral arguments in two related cases that involve the placement of the Commandments in public places. The Supreme Court has decided a series of cases involving the public display of Christmas crèches, Jewish menorahs and even the Ten Commandments, and yet while these court opinions have set some rough boundaries for what is permissible and impermissible, there remains a substantial gray area into which these two cases fall. Now, to examine the possible outcome and impact of these cases, we have with us today – I should say, back by popular demand since they’ve appeared at our programs before – two of the nation’s top experts on church-state questions, each with his own very different perspective, as you’ll see. You have a more detailed biographical sketch in the packet you’ve been handed, so I’ll keep my introductions brief. Up first will be Douglas Laycock, who is one of the country’s leading authorities on religious liberty issues. In this capacity he regularly testifies before congressional committees and has argued numerous cases in the courts including the U.S. Supreme Court. 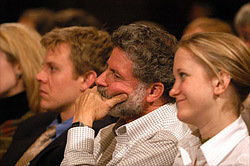 Doug teaches at the University of Texas Law School, where he has been since 1981. Before that he taught at the University of Chicago Law School, which also happens to be his legal alma mater. 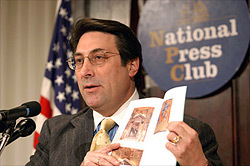 Like Doug Laycock, Jay Sekulow is no stranger to the high court. 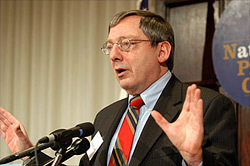 As co-founder and chief counsel of the American Center for Law and Justice, he has argued a number of very important church-state cases before the Supreme Court. 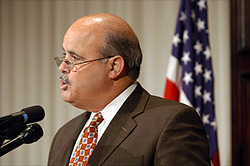 Jay also hosts a daily nationally syndicated call-in radio show, which is carried by hundreds of radio stations around the country. DOUG LAYCOCK: Not that high. Now, before I hand things over to our panelists I want to quickly mention two other items. The first is, as you were coming in there should have been a nice Forum backgrounder on these cases called “A Monumental Decision.” If you didn’t pick one up on the way in, please be sure to get one on your way out. It’s good reading for a snowy day, I guarantee you. I also would like to ask everyone to please turn off your cell phones and pagers so the speakers and other audience members are not distracted during the presentation. The discussion is going to be so engaging that you probably wouldn’t notice anyway, but just so that we can be polite towards everyone, please. And now, without further ado, Doug Laycock. MR. LAYCOCK: Thanks, Luis. I should say, as I did the last time Jay and I did this, he and I are more often on the same side than on opposite sides. We both file on what the press views as the religious side in free exercise cases, and I’m quite sympathetic to what the press views as the religious side in funding cases. In these cases of governmental religious speech I’m on what the press views as the secular side, although I’m usually representing religious clients who don’t think it is a good idea for government to take over their sacred texts, use them for political purposes and display them in county courthouses and capitol lawns. The basic standard the Supreme Court has announced over the years is that government may not endorse a position on a religious question. Government is not supposed to be for religion or against religion. Religious liberty means each of us gets to make those choices for ourselves. We don’t vote on religious questions. And unlike political questions where the government is entitled to try to lead public opinion, government really has no business in religion – the government doesn’t even lead public opinion, or isn’t supposed to, in that area. Each of us individually and in our families and churches is free to make up our own minds about religion without advice from the government. Now, under that standard, if the Court took that standard literally, plainly these government displays of the Ten Commandments have to come down or be given to a private owner. If you think about your common experience, people who put up a sign with a text on it expect you to read that text and agree with it, or at least think about it and take it seriously. People endorse the messages they send out. You don’t put up a sign that you disagree with – that is a very rare event. And the government doesn’t disagree with these signs either. The government puts up religious displays because somebody in the government thought it was a good thing to display and that people ought to read it and think about it and believe it and act on it, and that’s why we have a monument of the Ten Commandments on the capitol grounds in Texas and that’s why we have these displays in two Kentucky courthouses in the other case. So all this litigation, then, is about some explanation of why the Ten Commandments are up there, apart from the fact that we want you to believe the Ten Commandments. This is all sham litigation. Everybody knows the Ten Commandments are there because a vocal majority thinks they’re a good religious teaching and they ought to be displayed, but government officials are forced to say, “That isn’t why we did it at all.” They may not like the rule that they can’t endorse religion, but a majority of the court seems committed to that rule and so all the cases have to be argued within the boundaries of a rule against governmental endorsements of religion. And so the claim from the governmental side is always, “We’re not really endorsing the religion; we don’t really care about the religious teaching of the Ten Commandments. Their primary purpose, in effect, is secular.” And some religious folks are comfortable supporting that position. But others say, “Look, what you’re doing is systematically attempting to de-sacralize a sacred text. 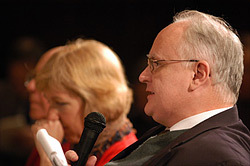 You’re taking the religious and sacred meaning out of it, at least for litigation purposes, and offering these transparently phony secular explanations.” And the principle – the secular explanation of choice for the Ten Commandments – is that these are important: the American law or the law of Western civilization or the Western legal tradition is based on, derived from, the Ten Commandments. These are the foundations of American law. So we’ve got three out the 10 that have some corresponding provision in law. Now, it turns out, of course, that killing, stealing, perjuring and defamation are very basic principles that appear early in every legal system, including legal systems not affected by the Ten Commandments. They were part of ancient Jewish law; they were part of ancient Egyptian law and Mesopotamian law, and ancient Greek law, and Roman law before the Christianization of Rome. And more relevant to the origins of American law, we got these rules from the common law of England, and the common law of England got them from the earliest inhabitants of England. Murder, theft, perjury and defamation were part of Anglo-Saxon law before the Christianization of the Anglo-Saxons and before they had ever heard of the Ten Commandments. These rules did not come from the Ten Commandments. And to say the Ten Commandments are about law is to rip them out of context, to strip away the clearly religious ones – “Have no other gods before me” – put all the focus on just the three that have secular equivalents, and then to distort the meaning and significance of those secular equivalents. The Kentucky case is, in some ways, even more extreme. The Kentucky folks quickly put up these nine other documents to say, “The Ten Commandments are just like all these other things,” and then they put in explanations to show how these things allegedly fit together. They didn’t spend too much time thinking about the plausibility or accuracy of their explanations. One of their explanations is that the National Anthem was inspiring to soldiers in the Revolution who were fighting about 40 years before the National Anthem was written in the War of 1812. And on the Ten Commandments they say, “The Ten Commandments are the foundation of the Western legal tradition and you can especially see this in the Declaration of Independence.” The one legal analogue they have is murder, theft and false witness. They don’t even go there. They don’t have the laws of the Kentucky murder and theft statutes up; they have the Magna Carta up, they have the Bill of Rights up. The Ten Commandments is a great document, but it does not say anything about individual liberty. It really isn’t connected to the Magna Carta or the Declaration of Independence, and the Ten Commandments and the Declaration display or state two fundamentally different theories of the nature of law and where law comes from. In the Ten Commandments, law is handed down from on high. The people wait in the valley at the floor of the mountain. Moses goes up. God hands down the commandments by an edict and Moses brings it back to the people and says, “Here, follow this.” And the theory of law in the Declaration is that governments derive their just powers from the consent of the governed; law comes up from below. We each vote on what the law is going to be. It is absurd beyond words to say that the Ten Commandments are reflected in the Declaration of Independence. They’re fundamentally different documents. Now, millions of Americans revere both; how can that be? Well, the answer of course is that millions of Americans, in their own minds, separate church and state. Religious law can come down from above, or religious teachings can be the direct word of God, but our political law – our secular law that we can go to jail for, that the government will enforce – is made by the will of the people and the consent of the governed. If you separate church and state, the Declaration and the Ten Commandments can both be two enormously important and foundational documents, but if you refuse to make that separation – if you try to run the two together – you get results that seem to be absurd. The Kentucky counties and the United States Justice Department have filed briefs that say, “It doesn’t matter; what Kentucky says about the Commandments doesn’t have to be accurate.” They say that explicitly – essentially, “It’s enough that they put up some secular explanation, however phony.” They don’t say “however phony”; but they do say that it doesn’t have to be accurate, and the Bush administration, the Justice Department, says it can be uncommonly silly and disunified and it’s still okay. Well, government does a lot of silly things and they’re not all unconstitutional, but if the point is that you’ve displayed a religious text and now you have to rebut the appearance that you’ve endorsed it by giving us a secular explanation that dispels the appearance of endorsement, that secular explanation has to make some sense. And what the supporters of the Commandments are saying is, “No, it doesn’t have to make any sense; any phony thing will do, however uncommonly silly or disunified.” That’s how the case is being argued. Well, how can they possibly expect to win on that ground? They can expect to win on that ground because the Court is not absolutist about enforcing its rule that the government cannot endorse religion. We talked here in this forum a year ago about the Pledge of Allegiance. I said the real question here is of course “under God” is a religious statement but the Court has what lawyers call a de minimus exception: things that are too minimal, too small to be worth invoking the powers of the Court and striking down, and two words, “under God” in the Pledge might be one of those things that’s just too short to bothered with. And I think the real question in the Ten Commandments cases is whether Justice Kennedy and Justice O’Connor will think this is important enough to be worth striking down. Knowing that there’s going to be a bit of political reaction and hostility to the decision, are they going to be willing to pay that cost? This is not nearly as de minimus as the Pledge of Allegiance was, in some ways. “Under God” was two words; this is a lot more. This is a sacred text from a particular tradition, a particular set of scriptures, about 120 words. Justice O’Connor in her opinion in the Pledge case said a prayer that lasted a minute and came in at 102 words was not de minimus – that that was too long. On the other hand, there are other ways in which this is less troubling than the Pledge because no one has to pay any attention to these displays. You don’t necessarily go by them, and if you do go by them you can just keep walking; you don’t have to stop and read them, whereas the Pledge was a ceremony in public schools every morning. Every child was asked to participate. So the Court may ultimately decide this is not worth bothering with. And if they would write an opinion that says, “This isn’t really hurting anybody; this is just a little bit of religion and we’re not absolutist – a little bit is okay,” a lot of people could live with that. But what’s likely going to happen is that if they decide this is just a little bit and we’re not going to spend the credibility and the political clout to strike it down, then they’re quite likely to write some phony argument about how this is connected to American law. And they will leave the law seriously confused. In closing, let me pick up one other point that I think is important to remind people of. One of the reasons, particularly for the Texas display and some similar displays from that era, from the ’50s and the early ’60s around the country, the Fraternal Order of Eagles was putting up these monuments with funding help from Cecil B. DeMille, who though it was great advertising for his movie about the Ten Commandments, but the original motivation of the Eagle’s project was a juvenile judge who thought that if kids in trouble read the Ten Commandments they’d have some rules of behavior and maybe they would live by them and stay out of trouble. And that seems a little naïve, but the question is, is it secular? Is that a secular reason for the Ten Commandments? And the answer is no, because it depends upon people accepting a religious belief. And the core debate about disestablishment of religion in America at the time of the founding was precisely over that issue, and the supporters of an established church said, “People won’t behave morally; we won’t be able to govern them unless they are religious, and so we’ve got a secular reason for supporting religion. The more we get people to go to church the better behaved they will be.” And the other side, the folks who wanted to disestablish religion in America, didn’t disagree with the start of that premise. They said, “That’s right; people who are religious will be better behaved and easier to govern, but religion doesn’t depend upon government support, and in fact is hurt by government support. Religion will be stronger, healthier, more vibrant if it is on its own, if it is voluntary, if it is supported because people want to be there.” And this argument that juvenile delinquents will be kept out of trouble is really a replay of that argument in the 1780s that government should support religion so that kids will see it and be more religious. That’s precisely the argument that was rejected at the founding when we adopted the Establishment Clause in the first place. 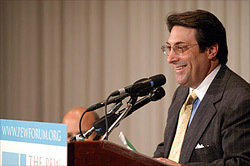 JAY SEKULOW: First let me thank the Pew Forum, and it’s always great to be with my friend Doug Laycock. Obviously, although most of the time we are on the same side of these issues, this is one of these times, like the Pledge of Allegiance case, where we’re not. I want to respond to something Doug said initially, and that is this idea of the utilization of the Declaration of Independence and its interplay with the Ten Commandments display, and particularly in the Kentucky case. I don’t think that, if you view the Declaration as a whole – which I think is the proper textual analysis – that it’s simply inappropriate here. First, Doug, you made the statement that the Ten Commandments – for you, law – is handed down from, quote, “on high,” and bestowed on mankind that way. The Declaration of Independence really recognized that, too. The Declaration itself says, “We hold certain truths to be self-evident; that all men were created equal, they were endowed by their Creator with these unalienable rights, and amongst them were life, liberty and the pursuit of happiness.” That was a recognition by the founders, which was actually based on a very John Lockean concept that rights, liberty, and freedoms do not simply derive from the government; that there are certain transcendent rights, liberties, and freedoms that do, in fact, derive from a higher authority, and that was, in the words of the founders, the Creator – and the idea that if government was the bestower of these freedoms and liberties, of course to our founders that meant that government could thus take them away. And the idea was that there were certain transcendent rights that were beyond the reproach of government, which required in that case that they be recognized as from a creator. So I think we have to put all of this in a historical context, and of course the Ten Commandments do predate the Declaration of Independence no matter the theory of counting you utilize. There is also a tactical issue in a case like this. That is, the Ten Commandments, perhaps more so than any other symbol, are uniquely symbolic of law. When people see the Ten Commandments, they think of law. And, in fact, you find this in the Supreme Court’s own chambers. Many people say when they look above the chief justice’s head and when you’re arguing cases – granted, we’re not generally staring over the chief justice’s head – but there is a depiction of something with Roman numerals one to 10, and no one knows for sure if that is the Ten Commandments or not. But there is one thing that is very clear – that if you look to the lawyer’s right, on the frieze, engraved in the marble is a depiction of Moses, and he is holding two tablets and the words are in Hebrew. There is no doubt that the founders were not writing words in Hebrew; Moses was not holding the Declaration of Independence; he was, in fact, holding what was a representation of the Ten Commandments. The words – the only words on that entire depiction of all of the famous lawgivers – are the words of the Ten Commandments in Hebrew. Now it’s not the entire Ten Commandments, just various phrases. But this portion of the Ten Commandments – Moses is holding them in the depiction and it’s clearly in Hebrew. What does this mean? That when the designers of the Supreme Court building itself looked at the depictions of great lawgivers, maybe for them also, the Ten Commandments was unique. It was different than the Code of Hammurabi; it was different than other famous codes of law – the Justinian Code, for example. It had a different appeal. Now, that doesn’t mean that the justices or that Cass Gilbert in the wonderful design decided that we must read, follow, and obey them. But there was a reason that they were depicted in the Supreme Court building itself. And I suspect that it was not the idea of the architect, Cass Gilbert, to have that depiction put in place to simply be a code to follow – a moral guidance if you will – but it also impacted a rule of law, an understanding of revealed law. In fact, in courthouses throughout the country – and we put this extensively in our brief at the Supreme Court – there are depictions dating back many, many decades to the Ten Commandments in various contexts. Let me give you a couple of interesting ones. There is one beautiful depiction of the Ten Commandments that is actually in the Pennsylvania Supreme Court building. It is a magnificent artistic painting with the words of the Ten Commandments in English. The under caption – and again, this is in the Pennsylvania Supreme Court – is the Decalogue Hebrew idea of revealed law. And, again, the words of the Ten Commandments are in English. We had a case at the U.S. Court of Appeals that is currently pending at the Supreme Court – and based on their orders list on Monday, I suspect it’s being held – pending these Ten Commandment cases, where a judge in Ohio posted a copy of the Ten Commandments among other documents in his court building. It was challenged; we lost. And at the Sixth Circuit Court of Appeals, as we’re walking in to prepare for the arguments and deliver the arguments to the U.S. Court of Appeals for the Sixth Circuit, there is a monument, a magnificent 40-foot-by-30-foot mural that would probably take up a good portion of this wall. It is a depiction of the Ten Commandments with the words again in English. Now, our Ohio judge’s display was about eight inches by 10 inches – maybe 12 by 12 – but it was small. And we argued the case and said, “Look, you have got it right here; walk out your hallway, there it is.” Again, it’s not up there to observe as a religious devotion, but as symbolic of the rule of law, or codes of law. The court struck down our judge’s display, conveniently ignoring their own display that has been there for literally 70, 80, maybe even 100 years. The Justice Department has frequent references to great lawgivers, including Moses and the Ten Commandments, in their building. But in the courthouses in particular and in the Justice Department building itself, there is a reason that it is there. And it’s not there to scare the school children of Kentucky, as was the case in Stone v. Graham as Justice Sevens expressed his concern in that case – “that, my goodness; we post the Ten Commandments; there could be some problems; students might read them, study them, venerate them, follow them.” I don’t think that would necessarily be a horrible thing, but Justice Stevens was concerned enough about that to say that was a basis for a statute requiring the posting of the Ten Commandments to go very different than this case. But you have to look at the Ten Commandments in this unique universal appeal as a code of law. It may not be a code of law that every tradition understands, and we live in a culturally and religiously diverse society. But when you see the tablets and someone with a beard holding those tablets, even if there is nothing written on those tablets, you kind of know it’s the Ten Commandments. It’s almost like – and I don’t want to give free advertising here; if I were to give any free advertising it would be for the Pew Forum for having these great events – but it’s kind of like McDonalds. You know, you see those golden arches, and you don’t have to see a whole lot else to know what it is. The Ten Commandments have that same kind of universal symbolic association with the law. And I certainly don’t want to offend Wendy’s or Hardee’s, or anybody else. So I will say that as my disclaimers. But these are fascinating cases. It’s not so fascinating when you’re the lawyers doing these cases because although they are interesting and thought provoking, they are difficult no matter what side you are on. Someone asked me, is there an easy Establishment Clause case? And there is one I can think of: a school district that had a policy saying teachers must lead a prayer at the beginning of the school day. That is probably unconstitutional – it’s pretty easy to argue that one. Short of that, everything else is line drawing. In this case, the court talks about how context matters. Why did they take two cases? Why did they take a case out of Kentucky and a case out of Texas? One of the monuments or displays is interior with other codes of law around them; the other one is a monument that, actually, as Doug mentioned – whatever the motivations of the juvenile court judge in Minneapolis were initially to have the Ten Commandments up as a moral code – Cecil B. DeMille decided that it would be even better to have it as a promotion for the movie the Ten Commandments. And I’ll give you a little anecdote. In preparing one of the cases that the court looked at a few years ago that I was counsel of record in – and although the court did not take the case, it received a lot of interest – the chief justice and Justices Scalia and Thomas actually issued a dissent from denial of review. In these cases you tend to become an expert in something, and I became the expert in how these monuments actually got there. And they actually would have – and I kid you not – Moses as depicted by Charlton Heston and Yul Brynner, who was pharaoh, attend these various events where they would have the dedication of these monuments. Now, they didn’t go to all of them – I think there were 4,200 of them throughout the United States – but in the bigger cities they went there for a clearly secular purpose of promoting the movie. Having said that, I don’t know if the lawyers advocating my position are going to utilize that. My advice to them would be it might be a good retort; but it also might get you in all kinds of trouble; and if you’re going to do that, you better be an expert on the cinema. Speaking of the cinema, to describe the Establishment Clause jurisprudence as confusing, complex, and contradictory in many cases is not an understatement. These are opinions that are hard to reconcile. The court has struggled with the Establishment Clause cases; there is no doubt about it. And this Lemon test – this three-part test of a secular purpose and it better not have the primary effect of advancing religion and we don’t want to get involved with what is an entanglement religion – it kind of comes up sometimes and then we don’t hear about it for a few years and then it comes back up again. Justice Scalia called the test “a ghoul in a late-night horror show that continues to” – as he called it in this particular case I argued – “stalk the school board attorneys of Center Moriches Union Free School District and frighten the little children.” Justice White, in retort, said that despite Justice Scalia’s trip to the cinema, there is a proper way to inter a precedent and that is to overrule it; they have not done so. The have ignored it when they have wanted to; they have worked around it when they have wanted to. This case is different, though. One of the certiorari questions presented deals with this kind of reanalysis of this test. And there is – if you were to count the majority of justices that have said this test isn’t working out very well, we would clearly get a new test. The problem is, I think there are probably five, maybe even six current justices that think the test isn’t particularly great, but five of them don’t have the way they want to proceed, and that presents a very difficult situation for those of us that handle these cases. Now, one of the issues that is going to be clearly relevant in the Kentucky case is what I call the taint issue. You know, Kentucky really wanted the Ten Commandments and the rest of this is window dressing and they put up the Ten Commandments first and then some lawyer got to them and said, “You know, you may want to have other documents around that.” In a case in Atlanta 13 or 14 years ago there was a challenge to the Ten Commandments display in the Cobb County courthouse. And the district court judge in Atlanta, said, “Look, put some other things around it and you’re okay,” and that kind of became the standard. Well, in Kentucky, they apparently first started without having this particular legal advice given about surrounding it with reindeer and candy canes, which is how you do a nativity scene in the public square by the government. You put up some other things and they say then it’s okay, the landscaping is right. So here they were going to put other things like the preamble but they didn’t start out that way. They started out with just the Ten Commandments. So here is my analysis of this. The idea is that we’re now going to say to a city or county official – the Supreme Court of the United States is going to say – once tainted, always tainted. It’s as if you kind of get the death penalty if you violate the Establishment Clause once. And I’m not arguing, by the way, that posting the Ten Commandments is in and of itself a violation of the Establishment Clause. But let’s assume the court didn’t like the history of the display and how it developed. Are we going to penalize a local county who is trying to figure out how to comply by getting various legal advice to figure out how to do this and maybe they really do want the Ten Commandments up there because they really do think there is both a secular and a religious purpose. (I mean, to go up there and argue that the Ten Commandments has no religious significance is absolutely ridiculous – no one is going to say that. I don’t think Cass Gilbert in the design of the building would have said that.) So it has both a secular and religious purpose. I don’t think that makes it disqualified. Not only is there a Ten Commandments display, by the way, in the Supreme Court inside that courtroom, but when you walk in – I think it’s the rear side maybe – there is a huge depiction of Moses holding those tablets of law, the Ten Commandments. So there are numerous depictions within that Supreme Court building itself and that presents an interesting issue. Does the lawyer arguing the case get up and argue, and as the questions are coming, do you kind of keep looking to your right? Do you translate the words that are written? – but you’d better pronounce the Hebrew correctly. There are all kinds of interesting issues. Does the court issue an opinion that requires a sandblaster to come in and remove the Ten Commandments depiction of Moses holding those stones? I think not. But if it’s not good in one case – I mean, context matters. Are we going to have to go back and review the documents of the architectural renderings of the Supreme Court building itself to determine what was the intent of the architects in putting up that depiction of Moses, and why did they only put Moses with words actually written? And in a language that is clearly reflective of the religious underpinning of the Ten Commandments, the words are in Hebrew. Why did they do that? I don’t think there a conspiracy going on; I don’t think they were probably even consulting lawyers. In fact, at that point the Establishment Clause wasn’t applying to the states, but it certainly was applying to the federal government and the Supreme Court was part of the federal government. So some people have tried to argue the whole Establishment Clause application with the notion that it’s a federal facility. So is the Supreme Court of the United States going to remove by sandblaster, I guess, or marble removal – however you would do that – its own displays? Are they going to walk across the street and say now that we have issued a decision in this particular case, we have got some other problems and we need some people to go around to all of the major monuments, including the monuments in the U.S. District Courthouse right here in Washington, D.C., that have statues of Hammurabi and Moses and Justinian? Do we send the police over to the Ronald Reagan building, which has a depiction of the Ten Commandments in it? What about the National Archives Building? More impressive maybe in its stature would be to send the court police over to the Library of Congress because in the Library of Congress, in the central main reading room, is a large depiction of Moses holding the tablets of the Ten Commandments. And if you can get behind the statue, you can see some of the text – it’s clearly a depiction of the Ten Commandments. Why is it there? It is there because it is a universal symbol of law. And the Supreme Court has to be careful when it issues its opinions to leave room, not only for its own display, but for the tens of thousands of displays in courthouses, in county facilities throughout the United States. So the reach of these two cases is very significant. Now, one of the things that we try to analyze and reanalyze on these matters is the motivation for accepting two cases. I have had that situation before, where they have taken two cases, and we’ve had to brief them separately, but generally consolidate them for oral arguments. Each party will issue separate opening briefs and reply briefs, but there is one argument. For the lawyers that argue these case it’s a lot of fun, but the fact is that it is the briefs that really matter more than the oral argument. So a lot of briefing is going on, but they are keeping the cases completely separate. What I think that means is that the court is looking to find some room for where these monuments or depictions are constitutional, and probably some warnings as to where they are not. And I think that is why the court has taken two very, very different cases involving the very same type of depiction. MR. LUGO: That was wonderfully thoughtful and provocative. Thank you both so much for setting up our discussion. I’m going to ask the two of you to come back up here, and I’m actually going to take a seat. This is a seating reversal for the benefit of our friends in the media who are taping this. That way they get a better shot of you up here. But my concern, of course, is that you’ll run wild and not pay attention to me, so I’m going to maybe kick you in the back if I need to grab your attention. I’m warning you in advance. As is our pattern, we want to open up the opportunity for our friends from the media to ask the first few questions. Please identify yourself clearly, hopefully giving us your real name – that’s become an issue here in town among journalists. So if you could do that, we would really appreciate it. MICHAEL MCGOUGH: I’m Mike McGough, and I cover the Supreme Court for the Pittsburgh Post-Gazette. This question is for Jay, but I would like to hear Doug Laycock’s response as well. I’m sorry it’s a two-part question. The first part is in regards to the taint question. We had the Commandments by themselves. Then we covered them with other things. And you were impatient of the idea that the court should really look at this as a subterfuge or sham litigation, which is the way Doug described it. But would you be a little more explicit about that? In this case, is it sham legislation? And the second part of the question – and this is not facetious – is, as a Christian, does it trouble you in the lawyer’s role to be making a tactical argument that some would say is bearing false witness? – saying that this is about a collage of documents illustrating the foundations of western law when what the people you’re representing really see it as is a way to say that we’re a Christian or at least a Judeo-Christian nation? MR. SEKULOW: Those are both good questions, and let me take the second question first, if I might. I don’t think it’s a sham if they would have just kept the Ten Commandments up there by themselves. I don’t think it’s a sham that in the Supreme Court facility, the only depiction with wording in it is Moses with the Ten Commandments, or that the Sixth Circuit Court of Appeals facility has a magnificent mural with angels surrounding the Ten Commandments. It’s clearly religious in its theme, but also secular in its view of the importance of law, and the Ten Commandments represented that. I don’t think that’s a sham. I think what happens with these counties – and I get these calls – is that they put up a monument and then they get worried. And then the lawyers say, “Well, you know, I don’t know exactly where the court’s going to come out on this, but I’ll tell you what they have been saying in some of the lower court cases, and that is that if you’ve got enough around it, it’s kind of like the Nativity scene with the reindeer, then you might be okay.” So the tendency is that this is lawyer-moved rather than necessarily client-moved. That’s not always the case, of course, and I’m not speaking to the Kentucky situation – I didn’t represent them in Kentucky. I will also tell you this. It was very nice of Luis to bring up the Time article. Fortunately for all of us, God does not need a lawyer. I always say that as a prerequisite, but I don’t think there’s anything wrong with religious symbolism taking on a secular meaning. When Justice O’Connor talks about ceremonial deism, I’m not offended by that phrase. I think that’s part and parcel of world experience and we do that. So it does not tend to bother me. MR. LAYCOCK: Oh, I probably will. On the taint question, of course a government can violate the Constitution once, deliberately or by accident – make a mistake and fix it thereafter. The question is, did you really fix it, and in this particular context under the endorsement test – the standard is, what message is the government sending? And so the fix has to actually and effectively change the message. And if what all reasonable observers see is that these counties are determined to display the Ten Commandment no matter what, and they’re experimenting to find the minimum amount of other things they have to put up alongside to let the Ten Commandments stay, my view is they haven’t really changed the message. But that’s one of the issues before the court. I don’t want to take a rebuttal on Jay, but I can probably focus or clarify the issues a little bit. I’m pretty sure Charlton Hesston and Yul Brynner didn’t come to Austin for the dedication of the Texas monument because if they had, there would have been a big news story and no one could find any record of what happened at that dedication, so I’m guessing we did it by ourselves. There are an awful lot of these displays out there and it’s a fair question then – are the people who are opposed to them really saying they gotta change all of them? And I’m sure there are some folks out on the wings of that movement that say you gotta change all of them. My own view would be, context does matter, but these cases we’re talking about are not closed cases. The frieze at the Supreme Court has lots of lawgivers, including people and legal codes that no American would endorse – Draco, who had capital punishment for everything, and Lycurgus and Sparta, who took children away from their parents at age six. So there’s no necessary endorsement of what’s up there. There is an artistic tradition that the Ten Commandments are displayed on two tablets, so there’s a place to put some text and I wouldn’t read anything more into it than that. The 30-by-40 foot mural at the Sixth Circuit I think has to go. It does seem to me to make a big difference whether there’s text or not because there is an artistic and an architectural tradition of using the tablets symbolically, and I think it makes a difference whether there are other depictions that fit into a sensible category to give it a secular meaning or there’s an explicit message. A museum display on comparative religion or the history of the Jewish people or ancient sources of law is going to have an unambiguous secular message everyone can see, but the easy case it seems to me is the Ten Commandments with a text, either all by itself or with a sort of hodgepodge of secular documents that don’t really connect to it. MR. SEKULOW: I want to talk quickly about the Sixth Circuit mural. The artist was Blashfield and the mural is called “The Law” and the words are written in English. It’s an incredibly beautiful depiction. It would be tragic if that had to be moved from the courthouse. I think it’s been there since 1912. Also, on the Supreme Court side – and I keep going back to this because I do look at the frieze – it is different than any other depiction of the great lawgivers because it’s not actually even on two tablets. You know, we normally see the arched tablets – that’s the depiction – but it’s not. It’s a straightforward-looking, flat stone with the words engraved in Hebrew. Those are the only words on all of the display. So this is not a question of what is it that is up there. And if context matters, it’s the only one where the lawgiver is holding the law. And that makes a difference. And of course, my view is that that doesn’t make it unconstitutional. I think it’s fine, but that does clarify exactly what we have here. MR. LUGO: Thank you. Linda? LINDA GREENHOUSE: I’m Linda Greenhouse from The New York Times. Jay, when you said the only easy Establishment Clause case is mandatory school prayer and everything else is line drawing – I wonder, do you think there is a justice on the Supreme Court today who would agree with Judge Roy Moore that his two-ton tablets were okay? MR. SEKULOW: We’ve anticipated the Roy Moore question. I think in Roy Moore’s case, you’ve got two complicating factors that would be very relevant that make it a difficult case. One is, without a doubt, you have a court order issued by a federal court judge and you have the chief justice of Alabama saying, “I’m not following that. I don’t think that’s binding.” That created a whole stir – it wasn’t so much the monument as the fact that we had a defiance of the First Amendment not applying to the states and they’ve tried that in Alabama before. It didn’t work out very well for them then, and I suspect it won’t work very well for them now. I don’t think Roy Moore’s monument in and of itself was unconstitutional. However, because of the way the Court looks at these cases, they’ve adopted the notion that context matters. And the context there, I think, would have created trouble for that monument if the Court were to grant cert in that case, which came up about this time last year. And the court has been avoiding these Ten Commandment cases like the plague, to use a slight religious example. But they have avoided them like the plague until this time because of the sheer number of cases that were coming up. And what happened was that the Third Circuit went one way and the Eleventh Circuit went another, three weeks apart, and there were six cases up at the Supreme Court at the same time, and I think they realized they had to do something here. MR. LUGO: Thank you. Any other members of the press? Jody. JODY HASSETT: Jody Hassett with ABC News. I wanted to ask Mr. Laycock how much you think we should or will hear about the question of intent in these cases and if there’s anything to be learned looking back at the Texas football prayer case on this matter of intent? And then I wanted to ask Mr. Sekulow: you spoke of the idea of the Ten Commandments and revealed understanding. I’m wondering if you could address the broader perceptions some people have that the goal here is not just the erection of the monuments or the papers, but a much broader application of the courts and decisions in the future about this revealed understanding version of law? MR. LAYCOCK: The Court’s endorsement test has two prongs. It’s not wholly unrelated to the Lemon test that Jay talked about, but particularly when Justice O’Connor, who is the originary of the test, elaborates that she says that there can’t be a purpose to endorse religion and there can’t be an effect of endorsing religion. And the purpose looks at the mindset of the people who put up the display. The effect looks at the mindset of the reasonable observer who is reading the display or looking at the display. It seems to me, and I think to a lot of people, that the effects part makes a lot more sense. That’s a question to some extent with an answer. And the focus on government having a bad purpose is anomalous. The Establishment Clause is not the only place where the court does that, but it’s pretty rare. And the Establishment Clause may be the only place where purpose all by itself, not connected to any additional element like discrimination, can render something government does unconstitutional. I think that’s unusual. Having said that, you know, they could go either way. I think we’re more likely to see an effects opinion. We’re more likely to see them talking about how a reasonable observer would perceive these displays, particularly in the Texas case. The record of what people were thinking at the time they did it is very sketchy. It was 40 years ago and most of the records haven’t survived, so I don’t think purpose is going to play a big role, but it could. MR. LUGO: Jay, there’s a question there for you there or you as well. MR. SEKULOW: Quickly on the idea of revealed law – that was a great question. That’s actually the phrase that’s utilized by the Pennsylvania Supreme Court when they defined the Decalogue as the Hebrew idea of revealed law. So undoubtedly the Ten Commandments have a religious meaning, and to say that they do not would be offensive to people of religious faith who respect the Ten Commandments. But they also have a secular symbolism, and that symbolism is reflected in exactly what Pennsylvania, I think, correctly noted was this idea that within the culture of Judaism at the time, and I’m certainly cautious of saying this with Rabbi Saperstein present, a tremendous legal scholar himself and someone I respect tremendously – if you’ll correct me when I’m wrong – but it was this idea of revealed law to the Jewish people from God and that was the impact. It was Hebrew revealed law, exactly what the Pennsylvania Supreme Court said. How does that play out at the Supreme Court of the United States? We’ll see Wednesday morning. MR. LUGO: For the benefit of the audience, I will clarify that the reference there was to Rabbi David Saperstein, who heads up the Religious Action Center of Reform Judaism here in town and is quite a scholar and an activist on these matters. David, I hope you’ll feel free to join in the discussion. MR. LAYCOCK: If I could say just a word on that. I don’t think the Ten Commandments are a secular symbol of law or a universal symbol of law – I think they are a Christian and Jewish symbol of law. MR. SEKULOW: Are they okay in the Supreme Court then? MR. SEKULOW: But Doug, this isn’t the Sermon on the Mount that’s been posted here. This is the Ten Commandments. We’re not talking about depictions of something out of the New Testament. So I think it does have more of the law feel to it because that is what it meant within that cultural context. MR. SEKULOW: Actually “Seculov” is what it was in Russia, but that’s okay. 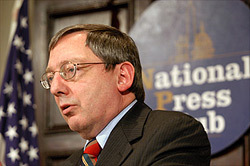 CHARLES LANE: I’m Charles Lane of The Washington Post, and I have two questions for Mr. Sekulow. I liked your reaction to something Doug said in his opening comments about the possibility that the Court might draw a distinction between a monument that’s kind of out there on the grass that you can just walk by – or find a different way into the state capitol to avoid walking by – and one that’s indoors in a building where sometimes you can be compelled to appear. And secondly, whether you think it cuts any ice that the Ten Commandments themselves are not a fixed document; that is, different versions of the Ten Commandments exist in different variances of Christianity and Judaism. MR. SEKULOW: And even within Christianity there’s some divergence, although the basics of all of it is there. It’s just there is some differential. Well, context matters, and the ability to divert one’s eyes or revert one’s eyes when walking into the capitol grounds in Texas will clearly be an issue. I mean, there’s no doubt about it, but I think the same argument could be made about Moses holding the Ten Commandments in the Supreme Court building – you’re not required to stare at that either, but those of us who argue cases there do have to be there. And I think the same thing in Kentucky. You could walk right by it. In fact – and I don’t think this was the case in Texas – but the reason this litigation picked up really in the last eight or nine years is that some of these county courthouses decided to clean their areas up and all of a sudden saw these monuments, which had been either hidden or just overgrown with weeds. They’d been there, some of them, 50 years. So there’s a little bit of a different situation in how they are viewed. But look, context is going to matter. If I was arguing the case for Texas, I would be arguing about the other displays in the general area. I think that will play a role, but again, I think this is going to be a case – two cases, I should say – where the court is doing some line drawing. And I’ve got two cases attached to this one – one’s in a judge’s courtroom, the other is outside as a foundations-of-law display at a school in Ohio. So with all of these, I think the architecture and how it’s viewed is going to matter. MR. LAYCOCK: If I could just clarify on the comment of mine that you picked up on. I wasn’t so much drawing an inside-outside distinction as saying that you can walk by both of these – in other words, distinguish each of these cases from classroom prayer or the Pledge of Allegiance ceremony in a classroom, where people are asked to participate, where it’s hard to ignore it. These are a lot easier to ignore. MR. SEKULOW: Yeah, sorry about that. Look there are sectarian differences, not only between Judaism and Christianity, but within Christianity. There’s what they call a Catholic version and then there’s a Protestant version. But what are they up there for? What’s the purpose behind it in forgetting what the original architects thought? If you view it as symbolic of law, I don’t think the fact that there’s differences between versions creates a constitutional crisis. I think you have to acknowledge that as a fact, by the way. Anyone that studies this knows there are different views of this. But that should not be the lynchpin in these cases because the reasons they’re depicted in many cases is because of the influence they have on law. It’s very different than mandatory posting inside a classroom where students have to study. But students that go to the Supreme Court of the United States are going to see Moses and if they read Hebrew, they’re going to be able to read portions of the Ten Commandments. And again, the differential in the versions is not, to me, a significant issue. It’s a great question, though, and it will be asked, no doubt about it, by the justices because if you’re concerned that this is religious strife being created, well, what better way to create that strife than by saying everybody has different versions? MR. LUGO: Doug, did you want to comment on this one? MR. LAYCOCK: Yeah. I agree with that. There’s a Catholic version, a most-Protestant version, a Lutheran version, and a Jewish version, and there are theological debates underlying those differences. Most members of most of those faiths are oblivious to the deep theological differences, but some members know them. My wife, who’s not terribly sympathetic to some of the positions I take in these cases, said to me the other day, “You know, I was down at the capitol, I saw the monument, it’s got to go. They’ve got an extra commandment in there.” (Laughter.) That was her view. MR. LUGO: Yes, it’s actually from a time in our history when the Protestant-Catholic distinction made a lot of political and legal difference. Yes, there was someone here on this side. Yes, ma’am. ADELE BANKS: Hi, I’m Adele Banks from Religion News Service. 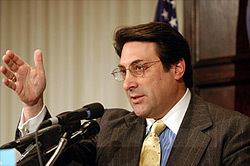 I was wondering whether Doug Laycock would say whether he agrees with Jay Sekulow about why the Court took two cases and then if either of you could talk about how the opinions might come out and if it will actually be two or possibly one? MR. LAYCOCK: I do agree they probably took two cases because the facts are somewhat different. Context could matter. They may both go the same way; they may try to split the difference. But I do think it’s a reasonable inference in their taking two cases. The reason the two cases couldn’t be consolidated is that the government side won and lost in Kentucky, so the briefs were filed in opposite orders. So all the people supporting the commandments had to file first in the Kentucky case and second in the Texas case, so it was impossible, I think, to consolidate them. My guess is that we’ll get separate opinions in the two cases, but they could be consolidated for opinion purposes. That wouldn’t surprise me at all. MR. SEKULOW: What was surprising to me about the two cases being taken was – Doug’s absolutely correct – that they were different postures. They responded to one case as the government, and they petitioned the other case as a government, so it’s a different scenario, but generally, what they would do if there’s a similar type of situation, you take one, you decide that case with what they call GVR. The Supreme Court, when they have similar cases before it, will take one case and hold the others. Once the decision comes down they issue what’s called a GVR. They grant the petition on the pending case, vacate the lower court opinion and remand it to the lower court with an order to rewrite the opinion in light of the decided case. It’s not what they did here, although they are holding a series of cases, post the granting of certiorari on these two, so there’s a number of them up there in a variety of contexts. And we’ll see what they do. MR. LUGO: Were you also asking about how the decisions are likely to come? – I mean, March madness is almost on us here, with everybody filling out their brackets for the NCAA basketball tournament. She wants some brackets filled out for this decision, particularly I assume, the all-important O’Connor swing vote. MR. SEKULOW: I think they have to keep some room for Ten-Commandment-type displays – they’re going to going to carve out some exception. Because look, counties are smart. They’ll say, “Okay, well, we can’t do it that way because that was a problem, so we will have a depiction of Moses holding the Ten Commandments and we will have other lawgivers. And we will put the words in Hebrew and maybe we’ll translate them into English.” And that shouldn’t create a – I think there’s going to be room, but it’s anybody’s guess at this point. These are close cases. MR. LAYCOCK: I think we agree on that. It’s four to three and to strike them down, it’s up to Kennedy and O’Connor. And I don’t think anyone can predict those two votes. I share the intuition. They’re not going to draw a bright line. They’re going to leave some room, and the problem with that is, if they leave any room, we’ll be litigating these cases for the rest of the decade at least and maybe the rest of the century. The specific facts – you can do it a little bit, you can’t do it too much, you can do it this way, you can’t do it that way – combined with the capacity of government to change the display as often as they want to or need to to try to make it okay means that if they try to leave room, they’re going to get an endless flood of litigation. MR. LUGO: Anybody else from the press? AL MILLIKEN: I’m Al Milliken, affiliated with Washington Independent Writers. Couldn’t you argue, even if our founding fathers or earlier generations were obviously seriously affected and showed public reverence for God and his word, that we are free as a different generation, at a later time, to reject his word and his laws as much as we choose to? Isn’t it possible, when Thomas Jefferson wrote the Declaration of Independence in 1776, acknowledging a Creator, he might have been in basic obedience to the Ten Commandments, but by the time he was president and appointing judges himself and editing the Bible during his presidency, he could have been ignoring and willfully disobeying at least a part of the Ten Commandments? And isn’t it possible that a nation as a whole that might have revered the Ten Commandments can change and now consider them irrelevant, particularly when it comes to changing its own laws? And didn’t God himself give Israel, the recipient of these Ten Commandments originally, the freedom to rebel against him? MR. SEKULOW: A 16-part question. (Laughter.) As God’s lawyer – (laughter) – no, I’m not; I should put a disclaimer that I’m not representing the Lord in this proceeding – but look, I think the founding fathers meant what they wrote. They did believe there were certain transcendent truths. And one of those transcendent truths was, “We’re not going to rely on the king to give us rights because the king has not been so great. So what we’re going to do is, we are going to really put down what we believe, and we really do believe that we’ve been endowed by this Creator with these rights. They’re not to be removed by the government. They come from God on high” – as Doug would say – “to mankind. Period. Government shouldn’t be able to take these inalienable rights away.” So if Thomas Jefferson reedited his version of the Bible or decided he wasn’t going to issue a Thanksgiving proclamation, I don’t think that changes what this means as a symbol of law. MR. LUGO: Linda, I back to you and then to you, sir. MS. GREENHOUSE: On this question of the diverse versions of the Ten Commandments, I want to defer to Rabbi Saperstein, but I got an email the other day from an Orthodox Jew who said that Jews should actually be offended by the depiction of Moses on the Supreme Court frieze because the Hebrew translates into the Christian version of the Ten Commandments, and I wonder if that’s true and if people have a comment on that. MR. SEKULOW: Interesting question. The words actually translated – the word they’re probably talking about is the word “kill” versus the word “murder” because there is some discussion – well, there’s another one I’ll add to the list – (off mike). Yes, well that is not – it’s clearly not depicted. There are several words that are very clear that are obviously part of the Decalogue. But it’s not a full translation. But I don’t think they’re going to – I can’t imagine the court penalizing the Supreme Court architect from 1930 who put that magnificent structure in place, and I suspect he didn’t have a religious motive. I mean, I don’t know that, but I don’t think that should disqualify them anyway. You can’t ignore the difference, that there are these various differences. Now you can argue with the subtlety of those differences in the versions, but then that’s exactly why we’re arguing they’re symbolic of the code of law. It’s got a significant, religious, sectarian aspect to it; no doubt about it. But it does transcend that. It’s like those arches – it is symbolic of something. And that’s why you see it in these courthouses around the country. MR. LUGO: David, did you want to issue a rabbinic rendering at this point, of the question that was asked? RABBI SAPERSTEIN: It’s hard to reconcile the words, the Hebrew as it is with the traditional Hebrew text. It’s a little bit different, a little bit off. So, you know, were they trying to capture that? Yes. Is it the literal wording? No. MR. SEKULOW: We actually did, though – I should say that in the reply brief, some of the words that are very clear are pointed out – were “testify,” “covet,” “kill,” “adultery,” “steal,” and there are some others. Some of them are not clear. David is right. It’s not clear, but again, I think it’s symbolic of what it represents as much as what is sounds. PHON HUDKINS: Phon Hudkins, Ethology News Service. If the Chief Justice is ill and misses the oral arguments or the vote, will that have an effect on the case? MR. SEKULOW: Justice Stevens always starts the proceedings by saying that although the Chief Justice is not present, he is going to review the transcripts and vote and he has indicated that on cases that are tied, he will vote. So you know, it’s been a factor that all of us who follow the court closely are always watching, but I think we have to anticipate that he’s voting and from my side frankly, that’s important because as Doug said correctly, these are very close cases and if the Chief Justice did not participate, that would be one less of my three that he knows I have and would give him the edge with the four that he’s got. So it would make it a difficult situation. But I think the plan is the chief is planning on participating – I know we’ve got a lot of the Supreme Court press here and that’s my understanding. Is that what you all are hearing? Same thing? Yeah. MR. LUGO: Mike, did you have a follow-up? MR. MCGOUGH: Yeah, real quick. There was a case from the Third Circuit where I’m from in Chester, and then there was a similar case in Pittsburgh that was dismissed in light of the Chester case where I think one way of characterizing what the court said was a grandfather clause, that sometimes when these things have been around for so long, they’re literally part of the wallpaper. And they come from a time when perhaps, this being almost completely a Judeo-Christian society, you could make the argument that the Ten Commandments are simply a proxy for the idea of law that you couldn’t make in 2001 in a more diverse country. Is there any way that sort of approach, that grandfathering approach, could be constitutionalized and brought into these cases or would the court have to really reach? The Third Circuit case had both this kind of historical landmark aspect to it and that the display was small and obscurely located, and unless you made a point of going up to it, you would never see it. And I can imagine a display of such longevity and historical importance where I would begin to accept that argument. But I think in most of these cases, you know, that’s just one more rationalization for an intense desire to keep government support behind a religious display. MR. SEKULOW: As fate would have it, I have in our brief the Chester County Courthouse depiction of the Ten Commandments plaque that is on their facilities. It has been there since 1912, as you know. And you mentioned a historic landmark. Here you’ve got a building listed on the National Historic Register, and to remove an exterior portion of a building that’s on the National Historic Register is a process in and of itself. Now, does that play into this? Somebody saw it because they filed a lawsuit, and I think the reality is you look at why it’s there. This pre-dates the movie so it can’t be based on the movie. It was put up there for a reason. It was the county courthouse, and maybe it was put there because it’s symbolic of a rule of law, which is what I would argue. MR. LUGO: Back to you, Charles. MR. SEKULOW: But they’re Hebrew. Go ahead. MR. LANE: But my question is, what would either of you say to the constitutionality of a display simply of a bearded man in a robe, looking kind of like Moses, holding blank tablets? Would that be a clear enough – like you say, the golden arches – that it evokes the Ten Commandments or because it lacks the actual wording, is it okay even for you, Doug? MR. SEKULOW: The Cuyoga County Courthouse, by the way, would be happy to know they could have Moses holding blank tablets. (Laughter.) Always prepared – nothing I haven’t thought through. MR. LAYCOCK: Moses is all by himself – (inaudible) – he is. MR. SEKULOW: Yes, yes, he is, actually. MR. LUGO: And this was before marketing and branding and all that stuff. MR. SEKULOW: Great marketing and branding. I’ve got a good client. MR. LANE: I mean, is it the words? MR. LAYCOCK: The words are certainly part of it because, you know, the symbol-of-law argument, which I find troubling because it’s only a symbol of law within a particular religious tradition, but the symbol-of-law argument makes more sense the more the display is merely symbolic, all right? And if you take away the text, it becomes a lot more symbolic. You take away the text, and you make it small, and you embed it in a frieze or a lot of other sculpture on the side of a building, it becomes just architectural and artistic. A large display only of Moses, with the text of the Ten Commandments – I still find that kind of troubling. But omitting the text helps a lot. But once you add the text, I find it impossible to say that is not an endorsement of the intensely religious message that is stated in that text. “I am the Lord thy God, have no other gods before me” – it’s not generic religion, it’s particular religion. It’s a claim of religious exclusivity – “I am the only God.” And to say, “Well, sorry, guys – don’t take it literally; we’re just using it as a symbol of law,” I think, is totally unconvincing to people outside that religious tradition and ought to be totally insulting to people inside that religious tradition. It simply doesn’t pass the straight-face test from my perspective. 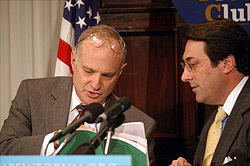 MR. SEKULOW: Well, let me give you another example, but I’d like to take the liberty of inviting Rabbi Saperstein to come up here, because he reads Hebrew better than I do, although I read some myself. And I think I know what this says. The Boston library has a beautiful depiction of the Ten Commandments with the words, “Lo’, lo’, lo’ ” in it. And I want the Rabbi to take a look. MR. SEKULOW: What does this say, though, right here, David? This is in the Boston library. MR. SEKULOW: Over the Ten Commandments in the Boston library main reading room, and lots of other words in Hebrew. So I think the Ten Commandments in Hebrew are fine, and clearly a sectarian aspect of that – “Moses, a man of God,” or whatever it is – I mean, translated with the words in Hebrew – clearly with the word, “lo’ ” [not] – which is a big issue in some of these depiction cases. We don’t have any hypothetical not covered. MR. LUGO: (Chuckles.) Absolutely. Yes, back here to – now we move to the legal scholars. Chip. IRA “CHIP” LUPU: Thanks very much, Luis. I’m Chip Lupu from George Washington University Law School. I want to come back to the question of the two cases and the possibility of splitting between them, and I’d like both of you to focus on Justice O’Connor because she is most likely to be the swing vote if this – it could easily be 4-4, and she gets to pick one way or the other, and she has shown a real penchant in the past on abortion, on affirmative action, on other matters, to look for compromises on religious symbols – the crèche versus the menorah back in the Allegheny County case. So she seems to have a habit of trying to split the baby and make everybody a little bit happy and a little bit unhappy. So she’s going to split between these two cases and say one is okay and one is not. Which one is okay, and what are her likely reasons for saying, “This one; not that one”? MR. LAYCOCK: Yeah. You know, I don’t know. I just don’t see the cases as much different. But what she might do is try to split the baby without splitting the cases – uphold them both or more. If she upholds them both it’s kind of a blank check for the government to do whatever they want; strike them both down, but write an opinion that says you can’t do it the way Texas did it, you can’t do it the way Kentucky did it, but here are some ways you can do it. I think that’s probably the most likely scenario if she wants to split the difference. If she wants to uphold one and strike down the other, it’s very hard to see how you choose. On the one hand, the Texas monument is a bare display of the text of the Commandments, a couple of religious symbols at the bottom and the top, and a statement this was donated by the eagles. There’s no pretense of any secular message being given there at all. The monument is in the context of these other 16 monuments spread over 22 acres that bear no particular relationship to the Ten Commandments. So it’s hard to say how that one is okay if you’re going to pick one. But then you go to Kentucky, where they put some secular stuff around the Commandments, but they made these claims about the legal importance of the Commandments that to me seem quite implausible. But at the very best they are quite controversial claims about the significance of a sacred text, which seems to me the kind of claim that government should not be making if people of some religious views think that these contributed to law, and people of other religious views think they don’t have anything to with our law, and it’s not the kind of argument that could possibly be resolved on clearly secular evidence and argument available to government. It is inevitably controversial, murky, unresolvable and dependent upon your view of how religion interacts with a society. I think it’s very hard to say government can take a position in that kind of debate and say, “Yep, the conservative Christian side is right and the Ten Commandments are the foundation of our law.” So the Kentucky case, in one sense, looks better – there’s some secular stuff surrounding it – but it also looks worse because there’s this quite explicit claim about the significance of a religious teaching. So I don’t think there’s much basis to choose between upholding one or the other if you are trying to uphold one and strike down one. MR. SEKULOW: Really quick, I think that in looking at this line drawing, that something Justice O’Connor said in her concurring opinion in Newdow could possibly point to where she’s looking at these cases. She made the statement that it would be ironic indeed if a nation founded by religious refugees would sever the ties that bind it to that heritage even today. A lot of people want to focus on Judge Moore’s two-ton monument, and that obviously galvanized a lot of media attention. But the fact is these monuments pre-date Judge Moore in some cases by 80 or 100 years, and it’s not the Christian right that put them up. It’s the Fraternal Order of Eagles – not to be confused, of course, with the band, the Eagles – (laughter) – that put thousands of these up around the country. I think the Court is going to do this kind of line drawing, but they’ve got to be really careful on where to draw the lines, and the Lemon test does not work out well in a lot of these symbolism cases. And the Court may be looking at the prayer invocation cases as one type of situation, and even the after-school Christian clubs because Lemon works with those pretty well and you could allow them under certain circumstances. And they may say, with symbolism cases, “We’re going to look at it differently.” You see some of that in Lynch v. Donnelly – the crèche cases. You may see some modification, but that could be a concurrence from Justice O’Connor rather than a majority, and that’s why this is going to be a fascinating case to watch. RABBI SAPERSTEIN: Thanks, Luis. Doug, if you could spend just a minute spelling out for the group your understanding of the secular reason test at this moment as the Court sees it? In other words, is it the original reason, or can it be a new reason? Will any secular reason do, et cetera? And Jay, could you just lay out for us your sense of where the line should be? In other words, if there were a Ten Commandments at a courthouse with a little inscription underneath that said, “We really hope judges, juries and litigants will cherish the religious legal values embodied in this text.” Do you think a clear religious message could be upheld? MR. LAYCOCK: I don’t think the Court has a clear view of what kind of secular reason is sufficient. They’ve dealt with these cases one at a time on their facts; often badly divided; sometimes without a majority opinion; often with – for the past 20 years – Justice O’Connor casting the swing vote. There are a couple of different categories – maybe three different categories that are discernible. In the first Ten Commandments case, Stone v. Graham, 25 years ago, which on the one hand looks dispositive – they say we don’t care what disclaimers or explanations you give us; it’s clearly a religious text – but on the other hand, that was in a public school classroom, and that’s the most sensitive place, in the Court’s view, for a government-sponsored religious message. They said of course the Commandments could be integrated – that’s the Court’s word – integrated into an instructional unit on comparative religion or ancient history. That’s one approach. And obviously there are lots of real situations. The religious text can be important for historical reasons, for comparative religious reasons. You know, it could be a survey of ancient lawgivers. If it’s integrated into something genuinely secular, that’s clearly not problematic, but that’s not what’s at issue really in any of these cases. The Kentucky case presents the issue of how minimal can integration be, how accurate does it have to be, and the government says it doesn’t have to be accurate at all. So that’s one line. A second line is in Justice O’Connor’s opinion, concurring a year ago in the Pledge of Allegiance case where she tried to provide a boundary for what she called ceremonial deism – that it has to be historically ubiquitous, and she thought the Pledge of Allegiance ceremony was; it goes on every day in every classroom. And I think most people, until Jay did his research, thought the Ten Commandments displays were not ubiquitous and, you know, maybe they are. And you don’t know how many of them there have to be before she will think they are ubiquitous. Second, she said it has to have minimal religious content. Two words was minimal. She says the prayers in Lee v. Wiseman, the graduation prayer case about ten years ago, were not minimal. That was about a hundred words each. She says it can’t reference any particular religion. “Under God” is, you know, about as generic as it’s possible to be. The Ten Commandments, on the other hand, state values that may appeal to or be acceptable in lots of religions, but they are from the sacred text of a particular tradition, and they do make this claim of religious exclusivity. I would find it difficult to say that they don’t reference a particular religion. And she said it can’t be worship or prayer, which the Pledge pretty clearly wasn’t. The Ten Commandments probably aren’t either, although people have suggested if you are a serious believer that re-reading the commandments again puts you in a worshipful frame of mind. So I don’t think the commandments are going to fly under her ceremonial deism standard, but they could. I don’t think these displays fall under “integration” either, but if the Court is looking for a way to uphold them, they could. On the Christmas tree, the menorah and the salute-to-liberty sign – the swing vote said, yes, this is really about religious pluralism. We’ve got two great faiths. They each have a holiday that falls about the same time of the year, and the salute-to-liberty sign puts the focus on pluralism rather than on either particular religion. So they could ask, well, is this like that? Is there some unified theme here? Is this all about law? Or is it one religious display in the middle, but some are about law and some are really just patriotic and don’t have anything to do with law? So that’s another pigeonhole they could put it in, and it doesn’t seem to me that either of these cases fits any one of those very well. It’s not integrated, it’s not thematically unified, it’s not de minimis, but it comes close enough that if the Court is looking for a way to write the opinion so they don’t have to invalidate all these, they could pick one of those and write it that way. MR. SEKULOW: Of course you could have – I could give you a really interesting hypothetical: If you had a talking snowman who is speaking the words of the Ten Commandments – (laughter) – what do you do then? No, there’s no picture of that yet. (Laughter.) David asked if you had the Ten Commandments displayed with a statement underneath, an explanation talking about venerating them and following them, what happens? My view is – and I’m not saying that I’m, by the way, the majority view on this – but my view is that context does matter because you’re going to get a question about what if it wasn’t the Ten Commandments but it was the Five Pillars of Islam? Now if it wasn’t the Ten Commandments, if it was a depiction of Mohammed holding some writing reference to – in Arabic – of the pillars of Islam, how would you deal with that? Except for the standpoint of what is distinctive about the Ten Commandments itself and why it is so depicted in these other venues – from libraries to courtrooms to state capitol grounds – it is so symbolic universally, at least within the American experience, of reference of law. So it makes a difference. But I think if you had something up there that annotates it with notes and comments, so to speak, and it clearly propagated a religious view, it makes it more difficult. Which brings up the issue of the little statement in Kentucky about the Declaration and Independence, and you heard what my answer would be. MR. LUGO: Thank you. Unfortunately our time is up. I know there are still some journalists who want to question these folks. We pay them such big bucks that I think it would be fair for them to stay around for a few minutes – (laughter) – to answer them. Actually I was quite chagrined by Time‘s “Top 25 Evangelicals.” The minute I read that I knew that Jay’s demands were going up. So that was the down side on that one. At any rate, thank you so much for attending and for your very thoughtful questions. And a big thanks to our speakers for their presentations. Please join me in thanking Doug Laycock and Jay Sekulow. Thank you very much.